Queensbury Farm, LLC was organized in 1991 by Sue Powers of Woodstock, Illinois. With CH Casual Elegance (Titleist x Daughter of Darkness) and WC Spindrift Fascination (Impression x Cassilis April Love) as foundation mares, a winning group of performers has already been established, all under the direction of Rick M. Wallen of Marshall, Wisconsin. 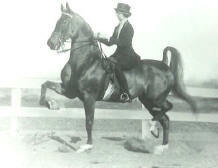 Growing up on the northwest side of Chicago, Sue began her equine career in 1958. At that time, the area was home to many boarding and livery stables, and the opportunities for learning all aspects of the business were limitless. Many acquaintances from that era are still 'on the scene' today, giving testament to the solid background so many received then. Starting out with hunt seat lessons, Sue then discovered the American Saddlebred and showed The Naughty Lady in equitation, bridle path, and juvenile three gaited events under the direction of Jeanette Durant. A powerful, challenging mare, every ribbon and trophy won was a true victory. A long hiatus from the "A" shows followed, and Sue showed under the direction of the late Tom Vale, enjoying (and learning from) all the "B" circuit 'do-it-yourself ' rituals. 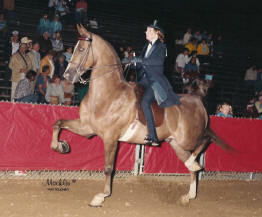 Under the direction of Matt Carfi and the late Carmen Carfi, Sue returned to the "A" show circuit with the five gaited mare, Charades at Dawn (Delta Flight) and CH Sir Dell. April,1985, marked the transition to Rick Wallen Stables. "Continuing the quest for excellence!"